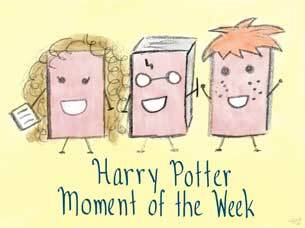 For this week's choose your own topic, I thought it'd be fun to talk about some of the HP quotes I use most often in everyday life. I'm sure I'm not the only HP fan who tries to incorporate as many lines from the books and the movies into as many situations as possible. Even when you know the other person you're conversing with isn't going to understand your cleverness. Fortunately for me, I converse with my cousins Ally and Melissa a lot, so we totally get each other's geek-speak. For back to school time, I like to break out, "Harry Potter must not go back to Hogwarts." When we walk to the library, there's a little tunnel we have to pass through that reminds us of the scene in Order of the Phoenix when Harry saves Dudley from the dementors. We've been known to yell "EXPECTO PATRONUM!" while walking through our tunnel. I say a lot of other spells, too, but for some reason, they don't work for me the way they do for Harry and his friends. ;-) I mean, I'll go, "Accio!" but nothing from the refrigerator ever flies into my hands. Same thing with Alohomora; my front door and car door locks refuse to budge. The HP-related expression I use most, though, is Ron Weasley's "bloody hell." Sometimes I'll even use a full, "Bloody hell, Harry!" even though there's no one named Harry around. I find it to be an all-purpose exclamation, useful in a variety of scenarios. Bloody hell, it's hot today! Bloody hell, why is it not Friday yet?! Bloody hell, that was an awesome book! And so forth. Haha, my HP friends and I have been known to use quotes to an excessive degree in the past, it's a lot of fun. Mischief managed is definitely one such quote! Great topic!! "Mischief managed" is another good one! Now if only I had a Marauder's Map to go with it, lol! Ha! I love this. Zane actually does the Accio! more than I do when he doesn't feel like moving and wants something to fly his way. I don't use quotes as much as I can relate ANYTHING back to HP. When I'm trying to explain something to people that I know have read the books or have seen the movies, I always relate it in some way to something that happened in the series. The other day I was trying to explain why the cure for Ebola was going to take a month to create, and explained that it was a lot like Hermione spending the month making Polyjuice potion and waiting for some of the ingredients to cure.